In 1985, B-Boys were all the rage, but where were the girls? Fast-forward twenty years for the answer: We B*Girlz, a lively look at the hot and happenin’ world of B-Girlz of the twenty-first century as documented by photographer Martha Cooper and writer Nika Kramer. Breaking is back with a new twist as today’s stylish fly girls can battle the best of them. Featuring pioneering B-Girlz like Rokafella from the Bronx, who now dances professionally, and Asia-One from L.A., who organized and promoted the B-Boy Summit for ten years, We B*Girlz—the first handbook for accomplished or aspiring B-Girlz and the boys who admire them—showcases the dynamic style and nonstop energy of B-Girlz in action, in practice, and on stage. 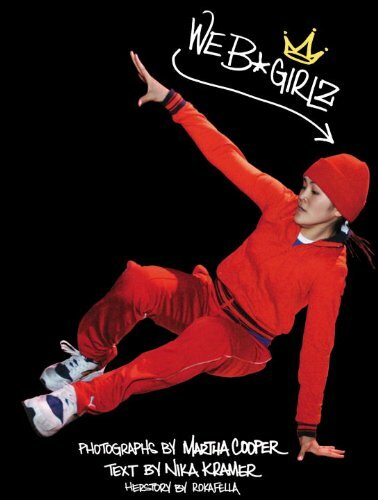 Providing inspiring insight into a previously little-known subculture that has swept the world, We B*Girlz includes chapters on Herstory, Girlz n’ Crewz, B-Boys, Floor Warz, We B-Family, We B-Stylin’, B-Girl Careers, and B-Girl resources, including information on websites, gear, events, competitions, and classes. Cooper and Kramer first began documenting the new breed of B-Girlz in a breaking competition in Germany in 2004. Following the dancers to the biggest battles—including Mighty4 in San Francisco, the Spinfactor Finals in Rhode Island, Breaklanta in Atlanta, IBE in the Netherlands, and the International Battle of the Year in Germany—they photographed and interviewed B-Girlz representing everywhere from South Africa to New Zealand, from New York to California, and from Japan to Germany. Culminating in the first annual We B*Girlz competition at veteran B-Boy Ken Swift’s studio in Brooklyn, Cooper and Kramer’s work will introduce a new generation to the art of B-Girling.